In March 2011, I discovered Kathi Appelt's Love Song For Librarians, a short 7 minute video which was posted on her blog. In the video she shares stories of the special librarians that made a positive impression on her life. At the time, I took the opportunity to share the video with my local librarians to let them know how much my family appreciated their efforts. I watched the video again this week with my daughter on my lap and by the end of video I had tears rolling down my cheeks. Watching the video and holding my daughter made me very thankful for libraries, books and the authors that write them. The bond that I have with my daughter has grown out of our mutual love for reading children's books. Kathi Appelt is an author of over 30 books for children and young adults including her novel The Underneath which received Newbery Honor in 2009. In an interview with Children's Book Radio she explained that her two sons lead her to children's books. "Through the experience of reading to them and enjoying the wonder of being in that circle -- a parent, a child and a book -- inspired me to try my hand at writing." My family read many of her picture books this week. My son loved her books about Bubba and Beau (a baby and a puppy) and their special friendship. 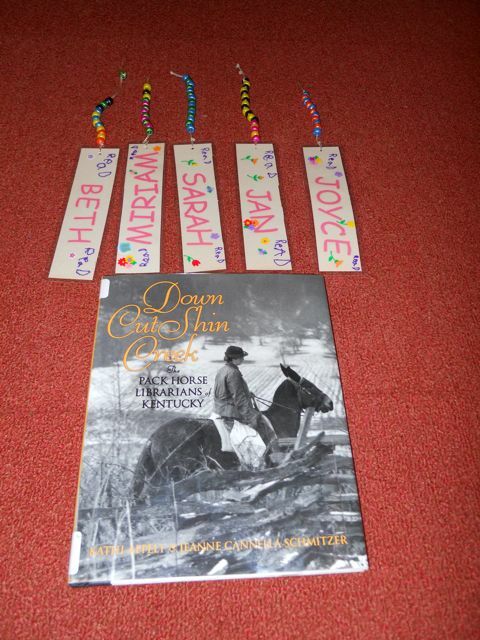 The book that grabbed my attention was Down Cut Shin Creek: The Pack Horse Librarians of Kentucky. According to Cynsations, Kathi Appelt discovered a website dedicated to the Kentucky Pack Horse Library Project while helping her oldest son with a research paper on Work Projects Administration (WPA) that was created by the New Deal under President Franklin D. Roosevelt in the 1930s. The website was not of interest to her son, but Kathi bookmarked it for later reading because of her "life-long affection for-all-things-horses." She contacted and met up with the website's administrator and librarian, Jeanne Cannella Schmitzer. Their collaboration lead to this fascinating book. "The book took two solid years of research and writing, including two trips to Kentucky." I admired the determination of the women that traveled the treacherous terrain on horseback to deliver books, magazines, and other printed materials to secluded homes and schoolhouses (for about $28 a month). I was excited to learn that Harlan County, Kentucky was the second county to receive pack horse library service. My wife and I actually became good friends (well, without getting too mushy -- started to fall in love) after we spent a week together in Harlan County volunteering in a school on Spring Break while in college. Wow! 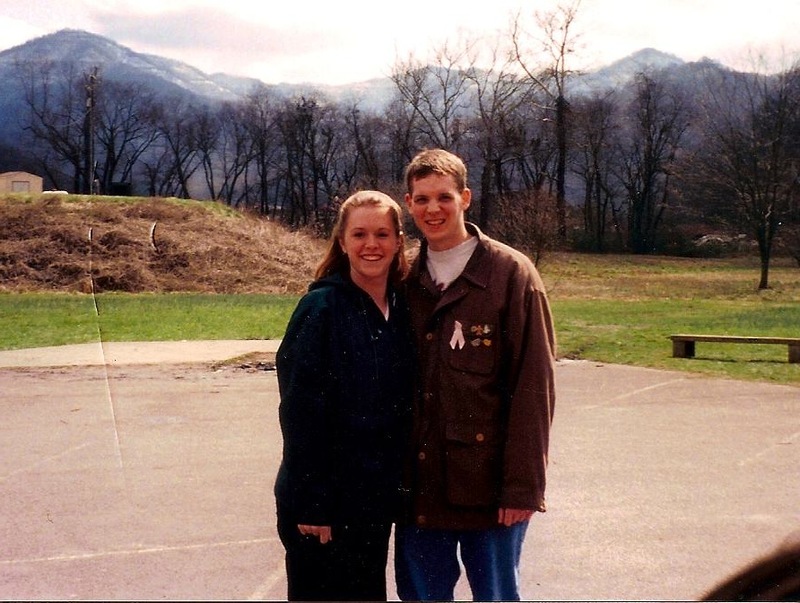 Look at those two lovebirds in the mountains! I read portions of Down Cut Shin Creek and showed many of the photographs to my daughter. We learned that the pack horse librarians had quite a job keeping the books and materials from falling apart. To combat patrons from dog-earring the pages they made bookmarks out of old christmas cards. We also learned that many patrons did not like the idea of receiving the books for free. They felt it was necessary to give the librarians something in return. Many exchanged recipes and quilt patterns for the new books brought by the librarian. This week to celebrate Kathi Appelt's birthday we combined the things we learned from Down Cut Shin Creek into an activity. We started by making thank you notes for the librarians in the children's department at our local library. In preparation, my children and I made a list we called, "What a Librarian Does for Me?" The list included the following ideas: Summer Reading Program, visiting my preschool, Story Time, choosing good books for the library, helping us find books to read, putting together book sales, and talking to us each time we visit. Once we had our ideas, we got out our markers, ink pads, and stamps to design the cards. The second part of the activity was to make bookmarks as a "gesture of gratitude" for all the things our librarians do for us. For each bookmark my children used stickers to decorate and personalize each bookmark. Then I laminated each and attached a string. My daughter then added beads! We are so blessed to have a community library that has great books and AWESOME librarians. You have been very supportive to my family and the blog! Thank you! My birthday comes so close to the 4th of July that I've always felt a kind of shared-birthday with good old Uncle Sam. That feeling was compounded by the fact that my paternal grandmother, affectionately known as Meemaw, was actually born on the Fourth of July. In truth, I was always just a little jealous of her. How wonderful, I thought, to be born on a holiday. In so many ways, it always felt like my grandmother had just a little something special about her because of it, not to mention the parades and fireworks and ice cream. Oh sure, my birthday was close, but it still just wasn't quite the same. Nevertheless, we always celebrated our birthdays together, always on the 4th of July. Years and years passed, and when she was in her late 90's, our family gathered for our birthdays, and she pulled me aside. "I have a confession to make," she said. It turns out that Meemaw was actually born on July 3rd, but one day, when she was just a teenager, she was at a high-falutin' tea party. She was sitting at a table with a gaggle of friends and they were discussing birthdays. One of them said, "My sister was born on Christmas Day!" Another claimed, "Well honey, that's nothing, I was born on St. Patrick's Day." One by one, it seemed like everyone at the table had a special birthday. My grandmother sat there, stewing. "Kathi," she told me, "I don't know what came over me. All at once I blurted out, 'I was born on the Fourth of July.'" From then on, she put that date on everything - her driver's license, her Social Security card, you name it. She effectively changed her birth date. I had to laugh. For most of her life, she had pretended to be Yankee Doodle Dandy, and no one ever knew. But here's the thing: I discovered it didn't even matter. She was just as special to me then as she ever was. She could've been born on any date and she would still have been my Meemaw. In what seems like poetic justice, she died on Valentine's Day in 2003 at the age of 98. I still miss her. And I still celebrate "our birthday" on July the 4th even though neither of us was actually born on that date. She was a firecracker, and I will always adore her. Kathi, thank you so much for sharing this story. Celebrating your books on your birthday has been very inspirational. We hope you have a wonderful birthday. I just so love Kathi's memory and her cheeky grandma! The video also brought tears to my eyes, I think librarian-love always will. 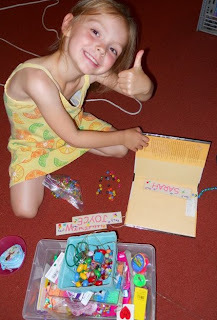 Super gratitude bookmarks! Kathi's birthday story is one of my favorites too. And the video -- I cry every time!